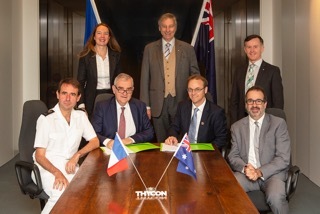 Australian marine technology firm AMOG Ventures Pty Limited (AMOG) and French naval technology specialist ECA Robotics (ECA) have formed a Melbourne-based Joint Venture company to pursue a Royal Australian Navy contract worth up to $100 million. Rolls-Royce has chosen Australian engineering company Marand as their preferred industry partner for the MT30 gas turbine enclosure manufacture and integration, should the BAE Systems Global Combat Ship – Australia (GCS-A) be selected for the SEA 5000 Future Frigate program. 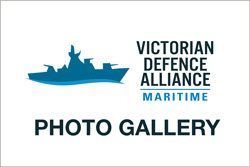 A delegation of Victorian Defence Alliances-Maritime members will join counterparts from South Australia and Western Australia to highlight the potential benefits of interstate shipbuilding collaboration. As a world leader in Digitalization, Siemens is pleased to partner with Pacific 2017 to host DigiHub. 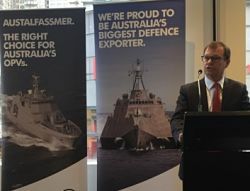 Austal and Fassmer are holding a series of Industry Engagement Forums across Victoria in support of their bid for SEA1180 the Offshore Patrol Vessel (OPV) Program. More than 70 local industry representatives attended the recent briefing in Melbourne's CBD, with a similar briefing already held in Bendigo and further events planned for Geelong (28 July) and the Latrobe Valley (early August - final date and timings to be confirmed). Current and potential suppliers to AustalFassmer’s partnership for the Offshore Patrol Vessel (OPV) Project are encouraged to attend. Victorian industry is expected to play a key part in the project’s supply chain. Austal is an Australian-based, global shipbuilding company and Australia’s biggest defence exporter. Fassmer is a leading German shipbuilder renowned for their expertise in ship design. Companies that haven't already done so are being urged to register your details on the Austal supplier registration portal, CPORT. By registering your company details and capabilities, you can stay up to date with valuable opportunities to work collaboratively with AustalFassmer to deliver the Offshore Patrol Vessel (OPV) Project - and support the end goal of a sovereign shipbuilding capability - as well as other future opportunities to work with Austal. The CPORT is accessible here. Photo gallery from VDA Maritime events.